Following Legendary’s and Warner Bros. Pictures’ 2014 success with the global reinvention of the Godzilla franchise, the companies have come together to create an epic, new shared cinematic franchise. All-powerful monsters become towering heroes for a new generation, revealing a mythology that brings together Godzilla and Legendary’s King Kong in an ecosystem of other giant super-species, both classic and new. Monarch, the human organization that uncovered Godzilla in the 2014 film, will expand their mission across multiple releases. The announcement that the reinvention of monsters continues was made today by Legendary CEO, Thomas Tull, and Kevin Tsujihara, Chairman and CEO, Warner Bros. 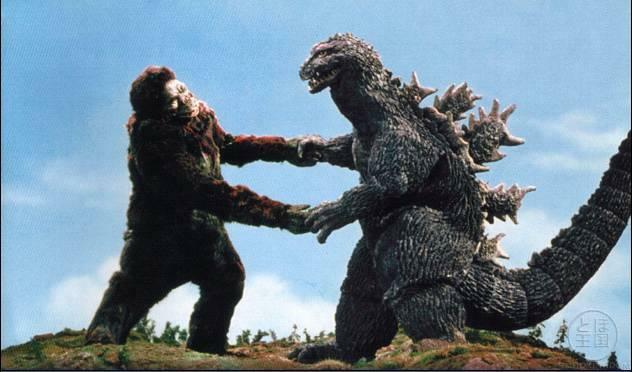 The initial trio of films are 2017’s KONG: SKULL ISLAND; GODZILLA 2 in 2018; and then GODZILLA VS. KONG, arriving in theaters in 2020. While Legendary maintains its new home at Universal Pictures, the GODZILLA films remain in partnership with Warner Bros., who will now also distribute KONG as a part of this franchise. Production on KONG: SKULL ISLAND begins October 19th. The press release also confirms Gareth Edwards is directing Godzilla 2. I am honestly far more interested in Godzilla taking on kaiju from his own pantheon than Kong, but Kong is a bigger brand name. Let them fight, I suppose.